"Competition among Renewables," with Natalia Fabra. "The Simple Economics of White Elephants," with Juanjo Ganuza. [Download the PDF]. For the word cloud click on the picture on the right. 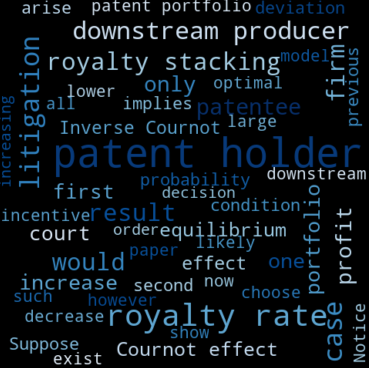 "The Inverse Cournot Effect in Royalty Negotiations with Complementary Patents," with Jorge Padilla. R&R at the RAND Journal of Economics. 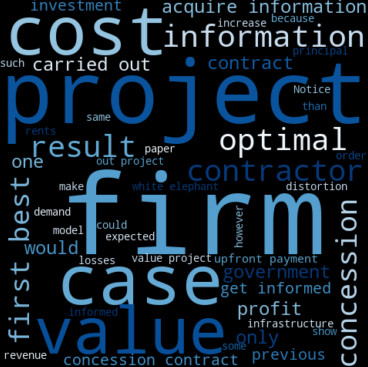 [Download the PDF] For the word cloud click on the picture on the right. “Organizational Hierarchy, Incentive Contracts, and Manager Turnover,” with Susanna Esteban.